Between my aching back (which thank goodness is all better now) and "one thing after another," we haven't had the time or desire to do much riding since early January. But with a little nudging from a friend (thanks, Barb!) we finally hooked up the trailer and left the boarding stable. Cloud literally jumped into the trailer she was so anxious to go out and see some new sights! The Glenwood Horse Trail is a 65 mile long multi-use trail in the Jefferson National Forest. An easy 40 minute drive from the stables, the trail is mostly located on the western slope of the Blue Ridge and often runs near both the Appalachian Trail and the Blue Ridge Parkway. Gus..... isn't he a handsome stocky fellow? Rain and winds the night before had cleared out and left the morning air crisp and smelling wonderful. I'm not missing the humidity and chemical plant odors of East Baton Rouge Parish! We had a pleasant 8 mile round trip "out and back" ride, following the Glenwood Trail south and turning around when we reached Belfast Creek. Under blue skies and with the temperature eventually up in the 70's; I started out the day with a light jacket which I took off before the end of the ride. It was another relaxing ride on Cloud who gets better with each outing. Sarge wanted to set speed records going home and so got a little "jiggy" for Joe on the return trip which is one of the drawbacks of not riding a loop trail. The rest of our group was Barb on Gus, Wendy on Dante, and Lisa on Tie. Poor Joe.... the token man once again! I expected more rocks and elevation changes but that four mile section was mostly flat, wide trail with good footing which will be perfect for moving out on when we get the horses in a little better shape. I'm planning to work on an effort to catalog the horse trails in this section of the state, so we'll be exploring this section of the NF a lot more in the spring. It was still warm enough to shampoo and hose down the horses when we returned to the barn. Then it was home to take showers ourselves so that we were fit to go into Lexington for our weekly bridge lesson. At least you can't say that we're one dimensional! the proper term for what we've been calling our upper "porch." I knew that "porch" and "deck" weren't quite right. but unfortunately my worst fears have been realized. At any rate the timber framing "up there" has finally been completed! It was quite a project and has delayed the metal roof by almost two months. No complaints from me about the delays since it looks spectacular. at long last being under cover and seeing the entire roof line of the house! and the house will be totally watertight. Look what the FedEx man just brought to our house!!! A king cake! Fresh from New Orleans! Compliments of our terrifically talented architect, Kevin Harris! Perfect timing as we're on the way out the door to bumble through another night of bridge. I'll be bringing king cake to share and maybe it will take everyone's minds off the fact that I can't count cards worth beans. We finally had the glorious snowfall that I've been waiting for since moving here last fall! and by bedtime we had a full six inches. Out for a romp before dark.... snow still coming down! Atta has only seen about 3 snowfalls and at 6 years old, she's still young enough to enjoy it. Mr. Biggs..... not so much! It's mostly melted away now, but it was fun while it lasted! Surely no one thought that I was awake and riding at sunrise! Not me!! Instead we were riding at Sunrise Stables which is where we're now boarding the horses. I never blogged about the move even though it happened January 1st. It was a difficult decision with pros and cons both ways. We had hoped to stay at the other farm "forever" but Sarge's turnout situation wasn't what we wanted, so we decided that a move would be for the best. Though Sunrise is just a few minutes from town and abuts I-81, it still has about 5 miles of trails. The only drawback to the trails is some interstate noise so you can't pretend you're in the wilderness! But the footing is great and so the conditioning possibilities are awesome. Yesterday it was warm enough for us to ride without coats or jackets and with their wooly winter coats, both horses worked up a good sweat! Does anybody remember the Berenstein Bears book "Spooky Old Tree"? Leaving the woods and back to the pastures.... do you know that until this moment I never realized that Cloud has stripes on her ears?! After the ride, Cloud drying off in her polar fleece cooler with the farmhouse in the background. We're having our first snowfall!! Snow!!! Finally!!! I'm Loving It!! We headed north to Charlottesville yesterday and spent the day trying to find some stone pieces for the chimney top and column caps. We pretty much confused ourselves and rather than narrowing things down, we got more choices all of which require longer lead times than we currently have available. But it was another successful few hours at Sarisand Tile. With owner Pete Sandfort's help, I made some final decisions on downstairs flooring as well as all three bathrooms. Still not quite settled are the half bath, laundry room sink area and the utility room dog sink/shower. I'm like a scattered kid in the candy store when looking at tile. I see so many possibilities that I have a hard time making a final decision. Pete was invaluable and I felt like he was really listening to what I had to say..... it was a pleasure working with him. The stone crew has been doing a good job on the columns!! Now if we can just get that roof!!! I made a quick run to the Kroger this morning to buy the fixings for a chicken gumbo which we shared with friends Barb and Rich. After dinner we attempted to play bridge and by the time that we are all 100 years old, we may have figured out how to make an opening bid. Seriously, this is one complicated game! But back to my Valentines Day excursion to Kroger! In addition to the balloons, cakes, candy and flowers, there were several display racks of these colorful tote bags commemorating famous couples. Ummmmm. Am I the only one who sees a problem here? Don't you think that there would be enough couples who have remained happily and faithfully married that it wouldn't be necessary to put divorced couples and those with chaotic relationships on the Valentine couples bag??! I mean I'm "just sayin'"
Scarlet and Rhett?.... though I'd like to think that she got him back, but it was looking a little doubtful on the final page and movie frame. Ava & Frank, Mick & Bianca, Elvis & Priscilla and Sonny & Cher were all divorced! Didn't Frida and Diego Rivera have one affair after another? I thought Bonnie & Clyde was ridiculous until I saw Kurt and Courtney.... I hardly know what to say about that one!! Guess I'm just an old fogey, but who in the world comes up with these things?! The Washington and Lee Mock Convention rolls around once every four years. It's a tradition that began back in 1908! Student delegates hold a simulated Convention to elect the Presidential nominee for the party not currently in the White House. It's a BIG deal! This years speakers included Jon Huntsman, Haley Barbour, JC Watts, Mike Huckabee, George Allen, James Carville, Ann Coulter, Eric Cantor and many others including current and former Governors, Congressmen/women and Senators. and only wrong twice since 1948! One of those misses was when the students chose Hilary Clinton instead of Barack Obama. I sort of wish they'd been right! Like most W&L programs, it's student organized and led. 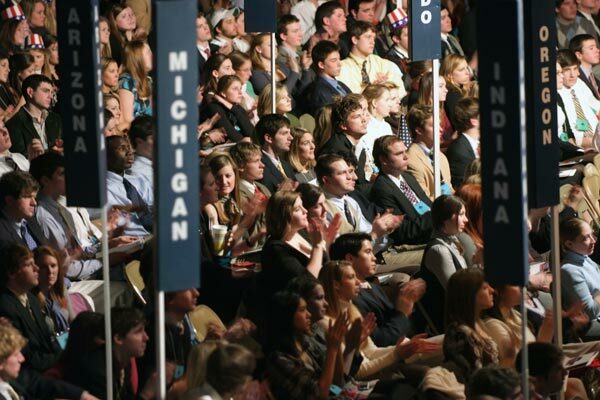 The steering committees have been working for several years to get ready for Mock Con 2012; students who are state chairmen have spent two years evaluating the politics within their state; banners, hats, flags and signs add to the realism of the event. .... wait did I say that they take it seriously? Well, all except for the parade on Friday! There were floats from every single state and territory. Jake and Elwood came to town!! What can I say about Utah, except that I wasn't the only one laughing aloud! with their "Sister Wives" float. but it was a stupendous 15 minute fireworks display to announce the conclusion of the final session and the commencement of the Presidential Gala. This town and school really know how to do things right! Guess the Sister Wives float didn't hurt him after all! Who wouldn't want to live here? It's a hoot! Walking in the woods last week, we were crossing the little ditch/creek that bisects the property. As I was making my way down the bank, I looked over and saw Joe prepared to do his best balance beam gymnast imitation. Between the slippery moss, the street shoes, the 5' drop and the titanium hip, I was wondering if I might be taking a photo of his last conscious moment. Thankfully this was about as far as he got before good sense prevailed and he joined me in the long way around! The ledgestone is going up and looking great! When we first began opening the boxes, the rock was a bit bland and grayish..... not at all what I was expecting based on the sample board that I'd seen. I decided to forge ahead and have faith after reading on the website that it was shipped immediately after being made and would take a week or more to lighten after drying out and curing. Sure enough it looks awesome now and the color is exactly what I wanted. The words "boxes" and shipped "after being made" should clue you in to the fact that we aren't using real stone. In Louisiana the largest rocks are pea gravel so I had a lot to learn about stone siding. I worried that the "fake" stones would feel like plastic or foam, but who'd have thought that they're made of concrete and so actually feel like rock?! In a perfect world using "real" stone would have been wonderful, but the cost was too high to justify when the look and feel of the "fake" stone was pretty darn close if not identical to what would have come from the quarry. The makers would prefer that it be called cultured and not "fake" though to me that infers a delicate growth process such as developing pearls in oysters instead of pouring colored cement into molds! Based on the recommendation of the local stone supplier who sells both the real stuff and cultured, we chose to use Dutch Quality Stone. It was a great decision since Dutch Stone came through for us in a big way! I had decided to break up the look of the primary ledgestone by scattering in a few fieldstones. The ledgestones are rectangular slices and the fieldstones are rounded. I'd seen a few photos where this was done and it gave a subtle variation to the otherwise monotonous horizontal pattern of the ledgestone. A few days before the rock was due to be ordered, I learned that the color that I'd chosen for the ledge wasn't available in the fieldstone. Aaaargghhh!! Back to the drawing board, but I wasn't happy about the roadblock. Never one to back down when there's something that I've got my mind set on, I emailed the company over in Ohio asking what they suggested that I do to make this idea work and lo and behold the next morning, I got an email back with a request to call the district manager! After I pled my case, whined and pretty much refused to hang up and take "No" for an answer, Wendell Mast the eastern regional manger for Dutch Stone agreed to make a small custom batch of the fieldstone in our color for just a very small upcharge from normal price. Six days later, the stone was here in Virginia!! It was one of those instances where I went in thinking "All they can say is No," and I came away with a "Yes"!!!! A huge "Thanks" to Dutch Quality Stone and Wendell Mast! I wish that we could have done the entire lower level in stone... that's the way that it was originally drawn when we were in the "put it all into the first phase of the plans and cut later" phase, but to help the budget, the lower porch area will now be the board and batten HardiBoard that is on the upper level. Too bad as this former Louisianan is loving the rock look!!! And for the big picture..... the rear rafters (already stained!!) are all up!!! The shadows give it a zebra house effect without the roof decking. I'll be glad to see the blue membrane get covered up with the real roof! P.S. Oh how I wish that I was being compensated for this blog post! Dutch Stone doesn't know about the blog and isn't helping out with our stone budget, I'm merely a pleased customer!